A perfectly paced poddle planned by Caroline to accommodate riders with problems – nasty cold, painful back, need to return early. However, welcome back to Superman Surge-on who was a splendid and problem-free addition and kindly slowed to the sedate pace. We reached Rowden Lane via Pot Bank – thankfully without incident. Geraldine, despite her cold carried on to Hampsthwaite and home while the remaining three convened at the top of Grainbeck Lane in Killinghall. John then surged ahead home and Caroline and I adopted an even more sedate pace to Skipton Road. At the junction with Westmorland Street, a familiar cyclist waved – Geraldine had completed her ride and was returning home ready for coffee as none to be had en route. There was a large turnout of Wanderers on a dry, frost-free morning. So at Low Bridge Liz F. suggested a second group go with me. So, 11 of us were the rearguard. We made our way to Occaney in small groups- partly thanks to roadworks and traffic lights. At the suggested rendez-vous , Group One was nowhere to be seen. So, slightly hazy about our ‘road map’, we did our best to work together to make our way towards Boroughbridge via the Dunsforths. At Marton five of our ‘team’ peeled off to Boroughbridge and home. We progressed towards Aldborough with Bianchi Bob as our leader. Suddenly he pulled in – a puncture. He felt he could just about manage on his own without our kind encouragement. So, off we set to track down the advance group. After a quick look in Plenty, we made our way to the Bean. Lots of bikes were there, so we deduced this could be Liz and co. Sure enough, the café was swarming with cyclists. Service was efficient and food generous [see photo]. We kept half an eye for Bob, knowing his speed at dealing with punctures. He finally found us after searching Boroughbridge just as some were ready to leave. So a quick sugar burst but no coffee and he was ready for off. There was a large gathering of cyclists this morning at Hornbeam due to better weather and probably people eager to get out after the icy conditions. 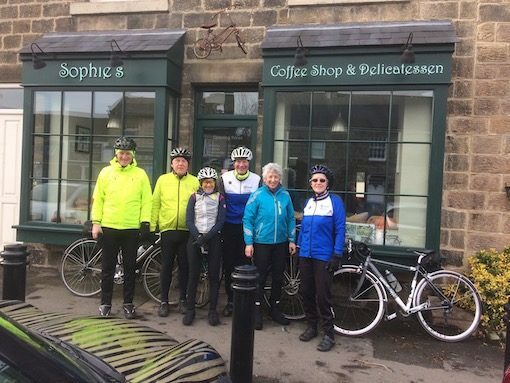 The Wanderers had turned out in force and around 25 were up for Liz’s ride and lo and behold it was not directly to ‘them thar hills’ but a flattish ride to Boroughbidge on to Ripon then home. The first group of five went off followed by a strung out groups of the remaining Wanderers of 20 plus. Through the showground on to Low Bridge, were a large group of EG’s were gathered and raring to go. Catching up with the first group at Low Bridge they set off first and the mighty group of 20 plus Wanderers gathered. Liz led the second group and Alison became leader of the third group. After vague instructions to meet at various points and directions, off we cycled down Abbey Road up through Knaresborough on to Farnham. The first group were seen and then they disappeared. Following them we cycled on through Arkendale up over the A1 and waited for the other group to catch up. It was getting cold and the third group plus some of our group appeared on the horizon and we set off so that they would not be too many on the busy road turning towards Marton. Two EG’s caught us up and as they were passing they relayed a message from Liz P that some of the cyclists had got held up at the lights and were trying to catch up. The plan was to stop at the next turning and wait for them, Liz P suddenly appeared next to me with the others and the second group reformed. I dropped the map out of my pocket which was retrieved by Liz P, which meant the leader me was now at the back. Catching up with the group who had just gone past the turning to Upper Dunsford put Liz F back in the lead as they returned to the route. It was a nice change to ride round some of the back lanes to the Dunsford and apart from the odd tractor and muddy roads hardly any traffic. A kestrel perched close by on the wire above our heads giving us great detail of this beautiful bird. On through Aldborough to Boroughbridge and in to café Vintage Bean. First group were already tucking in when we arrived. After settling in, Alison’s group soon followed but lost five who had decided to return home. Also Bob was missing, he had not been cycling for a few weeks, and he had stopped to repair a puncture and could not find the café, but finally found us just as we were about ready to go. 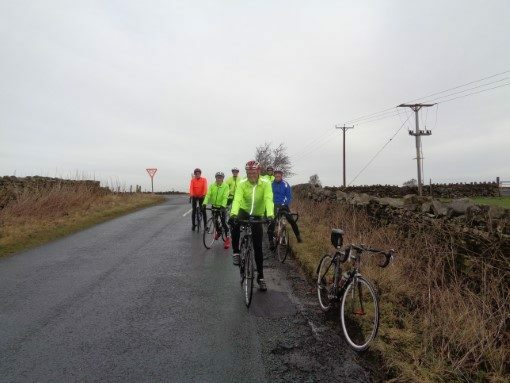 Everyone was enthusiastic about a “warm weather” forecast and set off on planned route to Pateley Bridge. We were let down on two counts, one it was very cold and two Wildings was closed. However no-one complained at the stop at Tea Cups where we warmed up, ate well, chose our drinks carefully and met up with James, Tim and Steve who were delayed with a puncture near the start of the Greenway.The route via Hollybank Woods, Burnt Yates and Brimham is a treat to go down in to Smelthouses and then again at Glasshouses to Bewerley and Pateley. Colin as ever keen to point out local highlights to our new young rider, George. Temperature forecasts of 6-8C with sunny intervals and a light breeze tempted nine of our usual number back on to their bikes this morning. Guided by the forecast, the planned route was an early-season tilt at the various climbs of the Wharfedale Circuit via Fewston, Bolton Abbey and Stump Cross. It soon emerged that one of the big challenges of the day would be keeping warm, as temperatures for the leg up to the reservoirs were well below expectation. With a quickly-established faster group setting the early pace, any remaining cabin fever soon disappeared with riders actually looking forward to some climbing to keep warm. At Askwith Lesley and Richard turned for Otley and an early coffee stop prior to returning home for an afternoon commitment – all after climbs of Timble and Low Snowden and a good morning’s workout. Although it was not on the official route (necessarily) some strange force drew the group up Carter’s Lane to tick off the first “Langbar” of the new season. After negotiating the road works on A59 we arrived at Abbey Tearooms at noon for a welcome warm-up. Clearly at this stage of the day temperatures of 8C weren’t going to happen but we were committed to our route with the knowledge that there were still plenty of climbs to come and, as one of our number pointed out, there were still plenty of cafes we could call at! 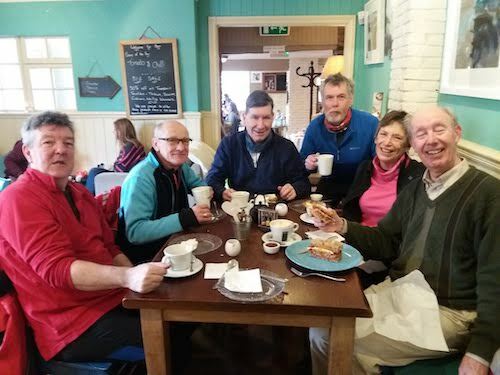 We all converged on Morrision`s Cafe in Boroughbridge, well where else could seventeen riders, all get served quickly and be able to wander round and chat to each other. The “A” team then decided to head for the hills, this was not an exaggeration they intended to climb Whitehorse Bank to the Gliding Club. The very thought of which made the “B” team have altitude sickness and nose bleeds. The “B” team comprising Bill W, Bob S, Dave Preston (t`other Dave P was climbing the White Horse), Nick and Norman, headed for Roecliffe, Bishop Monkton, Markington and own hill challenge, Hob Green/ Dole Bank. Then on to Ripley and back home by the good old Greenway,(how did we manage before we had it ? a bit uncomfortable and a bit dangerous). Especially nice to to have Bob S and Nick out with us today. Dave P.
could all regroup over coffee and teacakes and plan the next stage of the day. We bid farewell to the B Team who headed to Roecliffe, as the A Team set off in the direction of the White Horse. It was a large A team (at least 11), but Graham, the Whixley Wheeler, left us at Coxwold. When we arrived in Kilburn, with the White Horse looming large ahead of us the A Team split into two groups. The A- Team (names withheld to protect the guilty!) turned left taking the low route to Bagby, whilst the A+ Team (Chris B, Peter B, Colin, Dan, and Eric) continued onwards and upwards: up White Horse Bank with the reward of lunch at the glider club. It is a very long time since the EGs visited the Glider Club, in fact so long that none of us could remember being there on a Wednesday before, so it might be a first for the EGs. As we remounted our steeds after lunch, Peter discovered a puncture and insisted the others continued, leaving him to do the necessary. We had the adrenalin rush of the 45mph descent of Sutton Bank (boys will be boys!) followed by the relative calm of the return via Bagby and Topcliffe to Boroughbridge where further refreshments were taken.